Another Division title, another gut-wrenching loss. 4-3 at the hands of LA to drop another game 5 at home and get a new candidate for “worst loss ever” for this franchise. After 4 hours and 32 minutes, the Nats go home. At a macro level, perhaps this is always where we were going to end up given the losses of two key players and lingering injuries that the team dealt with late in the season. But this was clearly a missed opportunity. Max Scherzer did his part, starting the game by facing the minimum first 11 guys and pitching six scoreless. Hat off to Joc Pederson: that opposite field homer was a good swing on a bad but not awful pitch. From there the bullpen that had been so good in the first four games cratered badly, and in his haste to bring in the next guy to try to put out the fire, Dusty Baker double-switched his way into replacing guys who he really could have used at the end. In the aftermath, you always tend to look for moments of 2nd guessing. For me, I was texting back and forth with a couple of friends and so I have a nice little history of question marks. I think Baker took out Scherzer too soon; he was only on 99 pitches; yes he had that epic 13-pitch at-bat against series MVP Justin Turner … but he was only on 99 pitches! He was on normal rest, is a work-horse, and clearly could have continued. He had 7-8-9 coming up; not exactly murder’s row. Did Baker really think Grandal (series BA: .125) or Toles (series BA: .222) was going to beat Scherzer there? Or a cold pinch hitter? 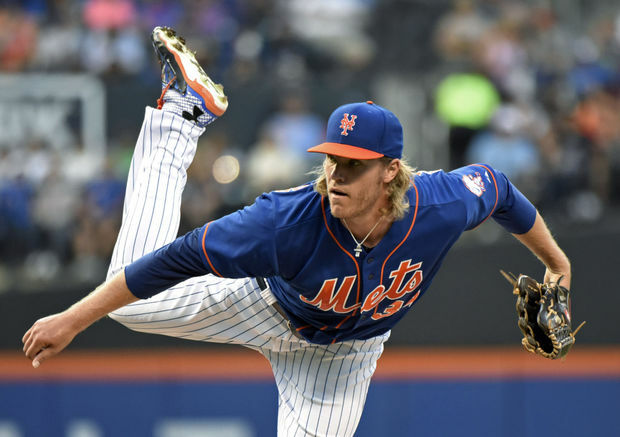 Would a proper center-fielder had a better shot at the Justin Turner triple?? Did Trea Turner take a bad route there? And, should he have held up and tried to play the carom instead of just running into the wall? Where the f*ck was Jayson Werth backing up the play? Would it have made a difference if that had been a double instead of a triple? Maybe; the not exactly fleet-of-foot Carlos Ruiz scored from first easily on that play; maybe he’s held at third or there’s a play at the plate for that 4th Dodger run. Because the next batter grounded out weakly. Every Nats bench guy got an at-bat in the 7th, 8th or 9th. Robinson, Taylor, Drew, Heisey, Severino and Difo. Honestly; they’re bench guys for a reason; I understand the logic of trying to push back the pitcher’s spot with all the double-switches … but when Wilmer f*cking Difo is at the plate instead of one of your most solid hitters all year (Anthony Rendon) to end the game, I think you’ve made too many moves. Yes, Chris Heisey‘s homer was amazing and had me screaming late in the night, but you should go down with the guys who got you there, not a guy who was in AA most of the year. Speaking of Rendon; It is fair to say he was probably the “goat” of the Nats offense. He went just 3-20 in the series and left an astounding 22 runners on base in five games (*seven* just yesterday). 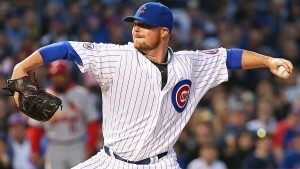 For as good as he was in the 2012 NLDS and as solid as he was this season, he came up short, badly, in this series. TWENTY TWO runners left on base from your #5 hitter; that’s really why this team lost. He had a homer and four RBIs in five games and, to be fair, his homer in game 3 was huge. But in the elimination games? Not one clutch hit from one of their most important hitters; would Wilson Ramos (who batted 5th the most frequently of any lineup position this year) have made the difference here? Who knows. Should Baker have gone to Melancon early (as his counterpart did with his closer) instead of his cavalcade of relievers? Hard to criticize him there; the guys who gave up hits had all been rock solid in the first four games. Was this just the workload catching up to them? Four straight relievers failed, giving up a walk, a single, an RBI-single and a crushed triple. Just bad timing for all of them to fail in a row. (Reading the comments, i forgot about the frigging Julio Urias balk move! That was total BS. The Nats have a real beef there and that has to be cleaned up next year. Again, not sure what that would have meant in the larger game outcome since it was man-on-1st with two outs but was a very poor call. I am less critical of the decision to send Werth home … who is up next? Espinosa and Lobaton? That was your best shot to get another run and you’re testing the whole relay system; two good throws had to be made under pressure and you often see those throws up the line or short-hopping the catcher; all credit to Corey Seager there for taking his time and making the play). All that being said … in the bottom of the 9th, you couldn’t ask for much of a better opportunity to tie it up. Two guys on with one out and your team MVP at the plate. The run expectancy of guys on 1st and 2nd with one out is .884 and the “chance” in percentage terms that a run scores at all is 40.6% … across all of baseball over the last 5 years irrespective of who was pitching. Not when you’ve gotten those runs against one of the best closers in the game (even if Kenley Jansen was totally gassed), nor when the best pitcher in the game Clayton Kershaw is riding in on his white horse on one day’s rest to get the save. That being said, I thought Daniel Murphy would have gotten a better bat on the ball. I dunno. I don’t think there was some egregious managing error (despite my hindsight-is-20/20 points above). All these moves were defensible in the moment, and at the death they had two guys on with their best hitter at the plate. Murphy popped up weakly and that was it. Better luck next year. Nats lose 4-3 … but showed some promise in the process. The offense battered Clayton Kershaw for 8 hits in 5 innings but only parlayed them into 3 runs thanks to some untimely strikeouts. Kershaw to me really struggled; pitch count way up, was missing locations badly, couldn’t throw his slider at all. 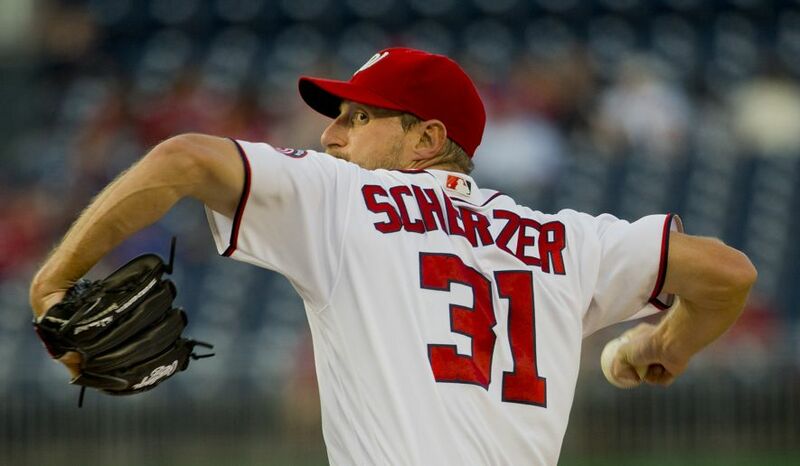 Max Scherzer seemed similarly off; the difference in the game turned out to be more of Scherzer’s mistakes ending up over the fence while Kershaw’s mistakes ended up as line drives through the infield. I guess maybe that’s as good of a summary of the talent difference between these two guys as any. You had to hand it to the nats hitters: Harper had good ABs, Turner had a clutch sac-fly in a key RBI situation, Zimmerman did not look overmatched at all. 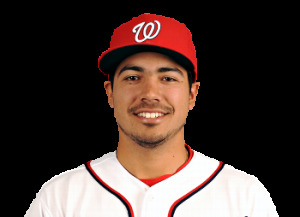 Rendon continued to look like the under-rated team MVP candidate that he has looked like all year. Severino; man have we already found our 2016 starting catcher? Espinosa? Yeah not so much; 0-3 with 3 strikeouts and 6 runners left on base. That’s your game right there; not one clutch hit, not even one ball put in play from Espinosa. I feel a lot better about the team’s chances in Game 2; when they went down 4-0 early they didn’t hang their heads; they fought back and were one clutch hit away from tying the game on numerous occasions. As a team they were 1-10 with RISP; a common refrain for “clutchness” that we’ve talked about often. But in reality, that’s just bad luck; if the team BA is nearly .300 then a 1-10 line is just bad timing. If it doesn’t rain that is …. I will be at the game, hopefully. Kershaw is a daunting match-up. Photo via wiki. Harper: 1 for 15; ok, that’s not good. 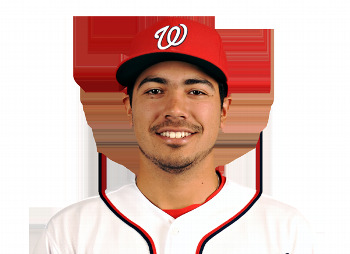 Rendon: 5 for 16; .313 but they are all singles; no power. Lobaton; 0 for 8; again, no surprise. Turner: never faced Kershaw but his career lefty split shows consistent average versus his Righty split but significantly less power; 13 of his 14 career homers have come against righties. Turner, Werth, Rendon, Murphy, Zimmerman, Harper, Espinosa, Lobaton, Scherzer. Also keep in mind: Kershaw has a 4.59 post season ERA. Its the playoffs: anything can happen. Last year for example he gave up 3 runs in 6 2/3rds in game one of the NLDS to take the loss then completely shut down the Mets in Game 4 on three days rest for the win … but the Mets did enough against the Dodger’s big two to take the series and move on. Yeah its a tough match-up for the Nats, or anyone. 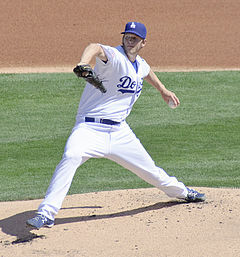 Kershaw shut them down in LA in June, giving up 1 run in 7. 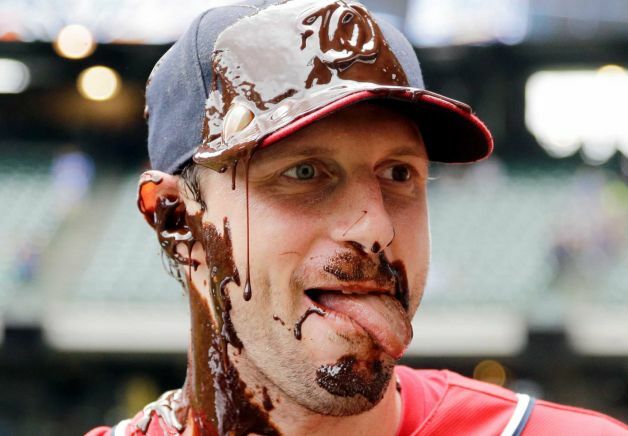 Scherzer somehow missed the Dodgers in both their season series this year; funny how nobody points that fact out when they talk about how the Dodgers beat the Nats 5 of 6 this year. The Nats used these 6 pitchers against the Dodgers: Petit, Roark, Ross in LA in June, then Lopez, Gonzalez and Strasburg in DC. The one win? Surprise; it was with lefty Gonzalez on the mound. I won’t make too much of this, since the Dodgers used 15 different starters this year and its frankly amazing they still won 91 games. That and the fact that the Nats missed their #3 Kenta Maeda in both series. Still, I like our chances with those career match-up stats.